Production AV were excited to be working with new client, Torry Harris Business Solutions through providing a complete technical event solution that included our new, ultra high resolution Desay x2.6i 2.6mm Indoor LED Screen to celebrate the fantastic 20 years that the company has been innovating the digital experience for clients globally and inspire their increasingly talented team to continue delivering the high-quality solutions THBS are known for. The centrepiece of the solution was a 5m x 2m LED screen using 30 of our new Desay x2.6i 2.6mm Indoor LED Panels that was built upon a ground support system and covered the rear of the stage. Two Novastar MCTRL 4K LED Processors were used to manage the data being fed to the screen with one acting as a fail safe hot back up to the main processor. Content was fed and scaled to the screen using our Barco S3-4K Screen Management System and easily managed when combined with our Barco EC-50 Event Controller. The S3-4K was also used to form a PIP (Picture in Picture) on the LED screen using the video feed from our Sony PMW-EX3 HD Video Camera positioned in FOH. Alongside the video solution, Production AV also provided the audio solution for the conference using our Yamaha TF1 Digital Mixing Console to manage several Sennheiser radio microphones that operated flawlessly throughout the event. 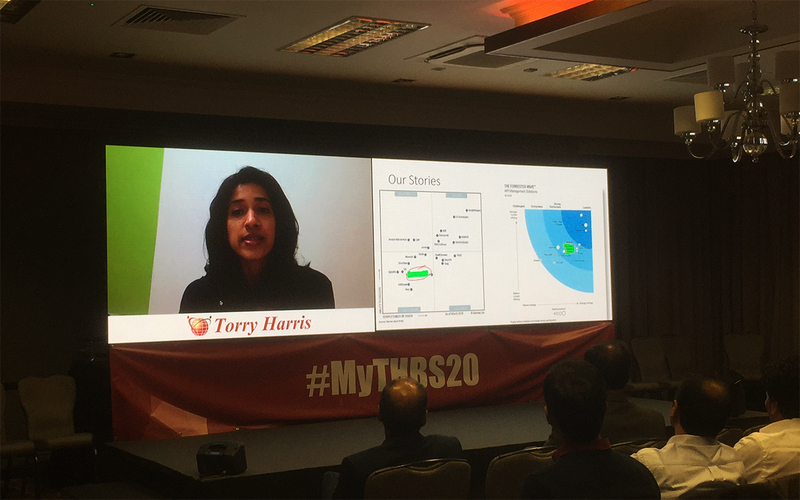 We were really happy with the performance of the Desay x2.6i throughout the day, as all of TBHS great achievements were crisply presented and the colours of the content perfectly reproduced. We’d like to thank TBHS for selecting us as the technical provider for this special event for their company. We look forward to working again with you in the future. New Premises for future growth. After nearly 10 years in our previous premises, the time has come for the move to our home for the next stage in the companies life. Preparation and storage of equipment had become increasing hard due to our increases in inventory, so the search for premises had been ongoing for the last 18 months. Eventually suitable space was found in Cheltenham with the move happening in early January 2019. 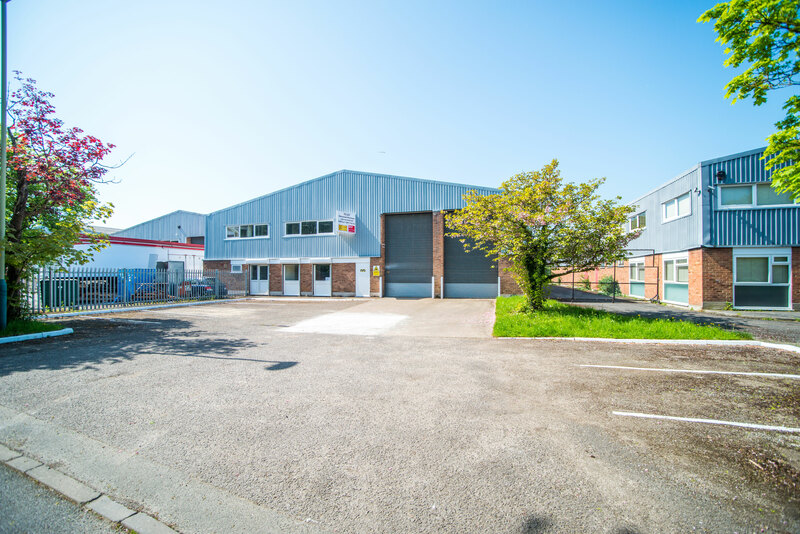 Offering over 9,000 square feet of space divided across 7000 sq ft of warehouse and the remainder as office and service space, we’re excited to be settling in to the new premises. The new space gives us the ability to build large LED screens or stage sets within the premises for pre-production purposes, as well as having individual spaces for meetings, and studio space for visualisation and programming of media servers. We’ll also be increasing our space for custom fabrication works to allow us to go the extra mile for our clients. 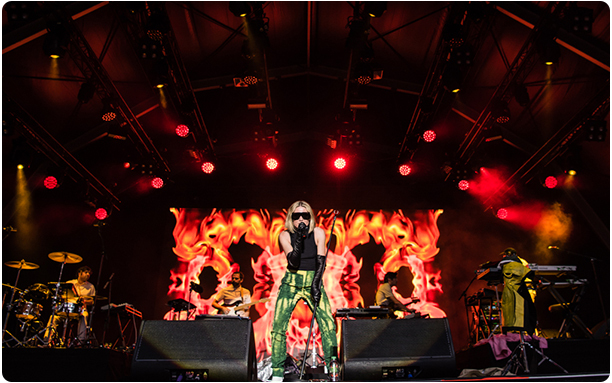 Production AV were delighted to be working for long term client Metropolis Music and having the opportunity to provide the video solution for this year’s Summer Series hosted at the spectacular Somerset House which overlooks the River Thames. 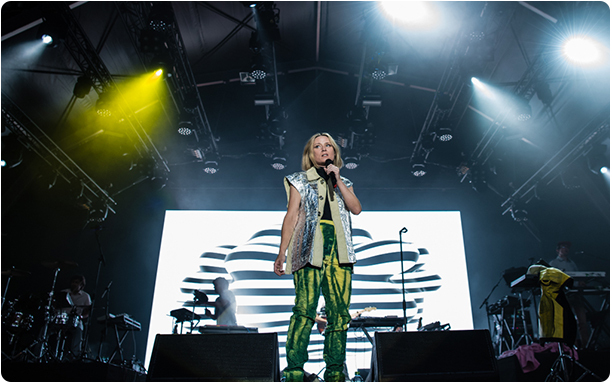 The eleven-night series promised an outstanding line-up of established and emerging artists such as MGMT, Flight Facilities and Sigrid so we were looking forward to a showcasing of world class talent across many genres of music. The video solution comprised of a 8m x 4.5m LED screen using our stock of Desay M6 Indoor/Outdoor 6.25mm LED Panels which was flown on the rear of the main stage and acted as a backdrop throughout the series. Content was scaled and fed to the screen using our industry standard Barco ImagePRO II Dual and a pair of Nova MCTRL660 Processors were used to manage the data being fed to the screen with one acting as a fail safe hot back up to the main processor. 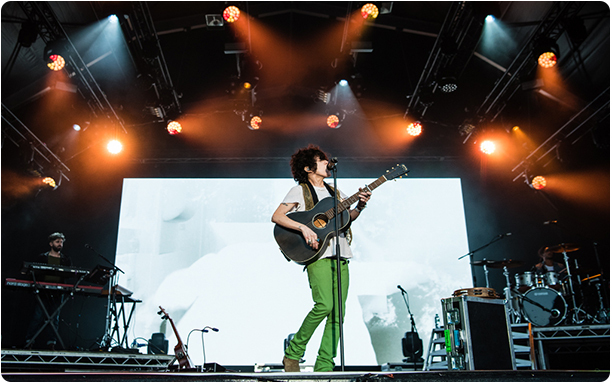 In video control, two Green Hippo Hippotizer Karst V4 Media Servers were provided to store and manage each artists visual content for their performances. We were really happy with the performance of the LED which worked flawlessly for the eleven days it was in operation and the content control using the Hippo media servers also made it easy to provide a flexible and responsive service to various artists requests throughout the series. It is always a pleasure to work with Metropolis Music especially when their is such a talented and diverse lineup to enjoy and we’d like to thank them for selecting us to provide the video solution for the Summer Series this year. We’re looking forward to the opportunities next year will bring! Production AV were keen to put our newly purchased Desay X2i 2.6mm Indoor LED Screen to the test and we were delighted to provide TBS Engineering, a company local to Production AV’s headquarters, an LED screen solution at their production facility using the X2i for a broadcast message from the CEO of TBS Engineering. With TBS recently constructing this new facility, the CEO wanted to host an event that would explain the direction and goals for this new operation and its employees as well as thank them for the productive and smooth early performance. Production AV were on hand to provide 3.5m x 2m LED screen using 28 Desay X2i 2.6mm Indoor LED Panels which provided a super crisp display for the several hundred in the audience to focus their attention on. The screen was flown from two warehouse cranes using our rapid rigging system which saw the screen built and raised swiftly enabling the production floorspace to be opened back up for TBS use. Two of our newly purchased Novastar MCTRL 4K LED Processors were used to manage the data being fed to the screen with one acting as a fail safe hot back up to the main processor. Content was scaled to the screen using our industry standard Barco ImagePRO II Dual with all the playback and processing kit located in a single flightcase positioned discreetly to one side of the screen. A 2m x 2m stage was also provided along with a lectern and an Soundcraft EPM 6:2:2 Mixer to manage the single microphone used to welcome the audience and introduce the CEO. The event was a great success and we were very impressed by the performance of the Desay X2i both in terms of the build design but also the superb image quality displayed. 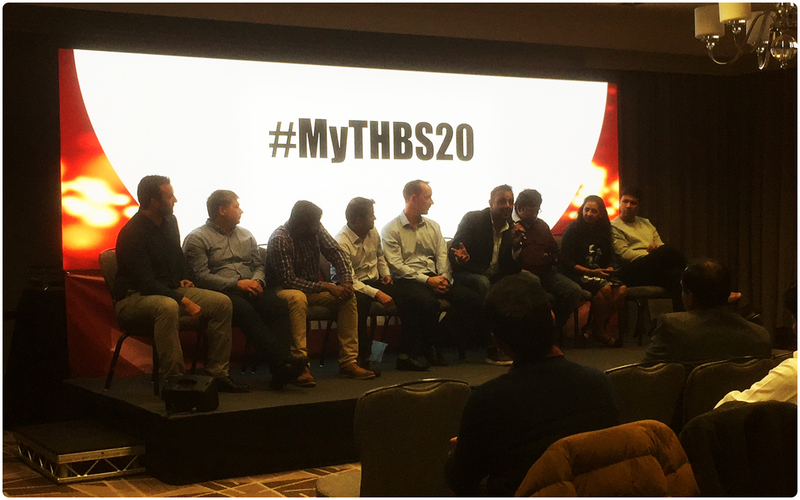 We’d like to thank TBS Engineering for selecting us as the to provide the video solution and we we look forward to working on more events with you in the future. Production AV are excited to announce that we have recently invested in over 200 panels of Desay’s X2.6i indoor LED modules. In doing so, we now have a significantly higher resolution LED option than our DigiLED 3.9mm and Desay 6.25mm stock and this will allow us to provide more technical flexibility and creative freedom to our clients. We are looking forward to testing the capabilities of our new 2.6mm LED product at leading edge events across the country. 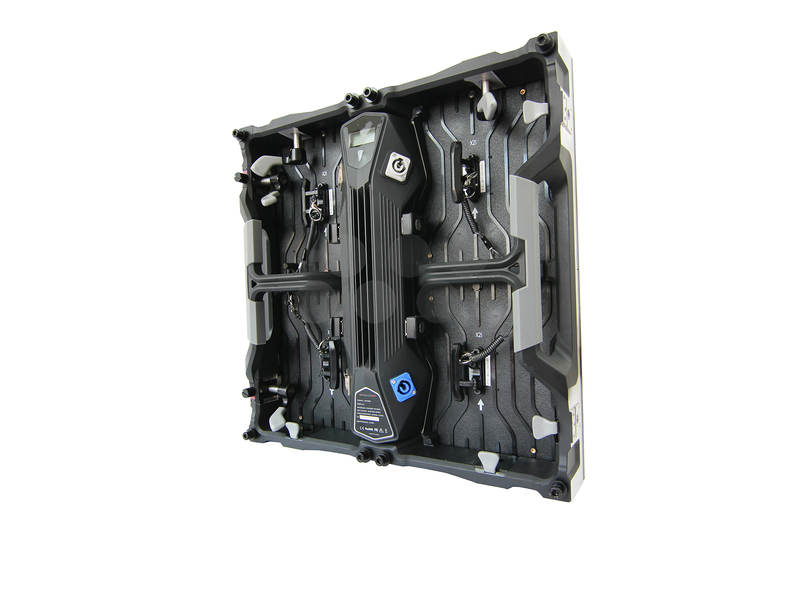 Having already invested in Desay LED screen, we knew that the Desay X2.6i would have outstanding build quality that had been engineered to operate impeccably within event scenarios. 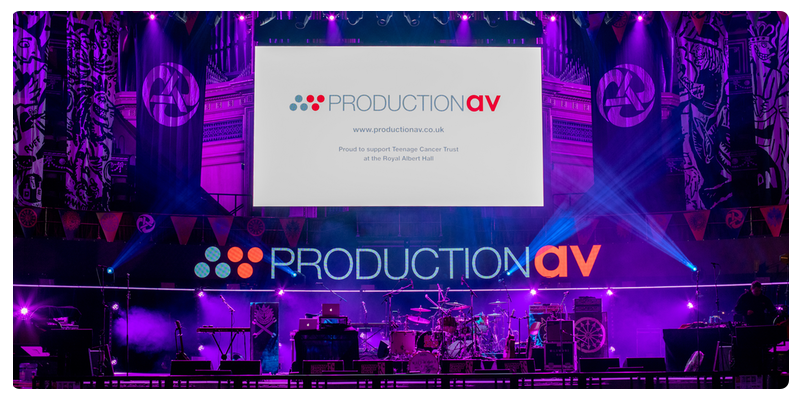 Production AV also invested a wide range of rigging hardware that enables screens to be either flown or ground supported depending on the specific requirements of your event. The screen has the ability to be built in both concave and convex configurations as either a flown or ground support configuration. Novastar MCTRL 4K LED Processors were also purchased as part of the investment, and when combined with the X2.6i and our Barco S3-4K Screen Managment System, a complete end to end 4K solution can be provided. 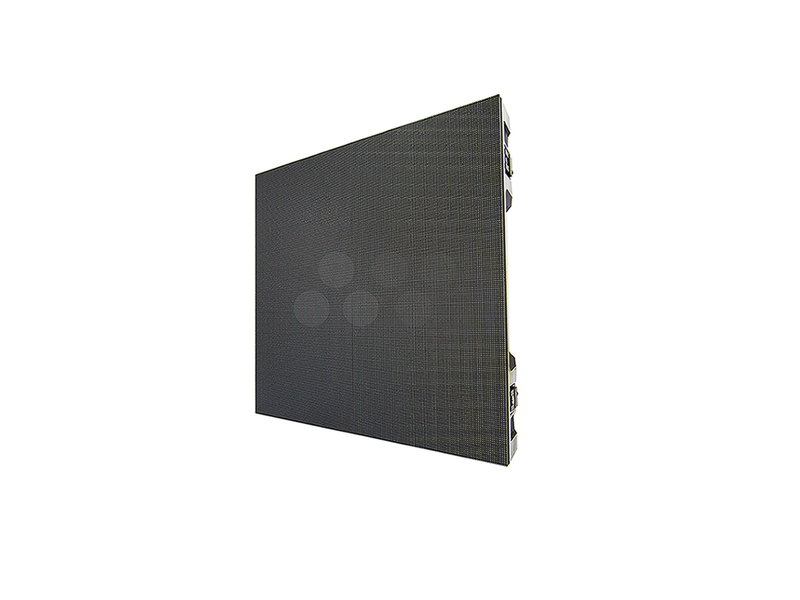 The screen itself has an high refresh rates and excellent color reproduction due to the 18bit greyscale processing making it an ideal option for an eye catching and close quarters video solution. The X2.6i has already been selected for numerous projects by our clients and we’d love for you to get in contact if you would like a quotation or a demo of the screen’s capabilities. Northamptonshire Police spotted a suspicious van parked in a lay-by about 15 miles from the scene of the theft on Sunday 26th. Thankfully the van contained all the stolen equipment, apart from a Leatherman and torch. All the equipment has, today, been returned to us. A massive thank you to Northamptonshire Police, and our Insurance brokers Ryan Waring and Richard from Vista Insurance for their work and support. Also a massive thank you to all the friends of the company that have shared the post across the various platforms, which hopefully had some impact on the thieves plans for the stolen equipment. We really appreciated it! We have suffered a vehicle break in between approximately 22:00 on the 23rd and 08:00 on the 24th August at the Thrapston Travelodge, Kettering. Our van was targeted in the car park of the Travelodge, with the thieves stealing a quantity of equipment, mostly marked as Production AV, but some sub hired from Central Presentations. Thankfully the equipment is spares or pool kit, so the event has started without any issues. All the equipment serial numbers are logged on our database, so if you come across any suspect items, we can verify the serial numbers. Qty 1Black 5 Star ‘Tall Norman’ production case with various tools, adaptors, tape and food/drink, as well as a quantity of our new mugs! The Northamptonshire Police crime reference number is 18000402947. If you have any information on the equipment, then please give us, or the Northamptonshire Police a call on 01452 372728 or 101 respectively. 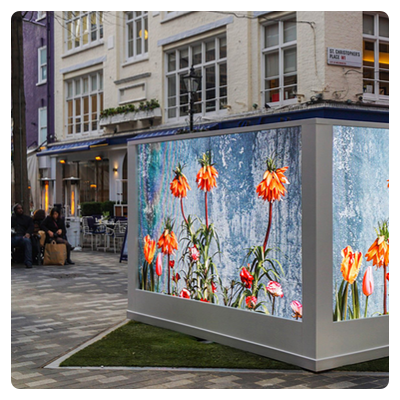 Production AV were excited to be working with new clients Four Communications to create a spring themed activation event hosted in the centre of St Christopher’s Place Square. 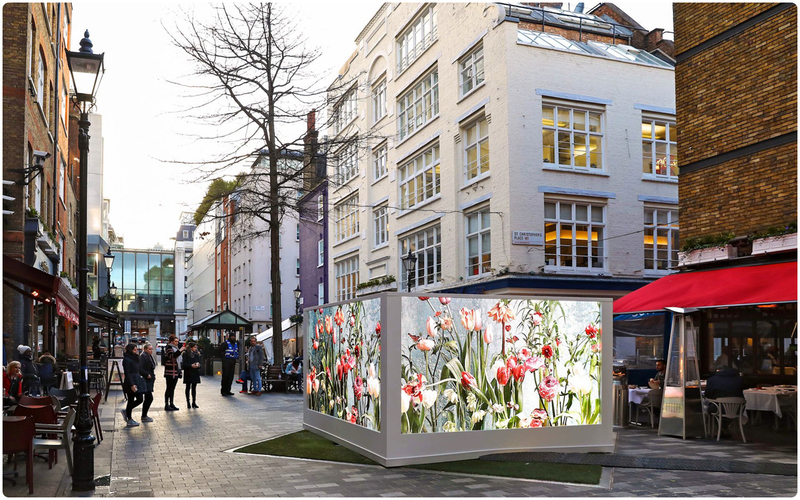 The ‘Spring Rituals’ film was created by both floral designer Flora Starkey and Prettybird’s founding partner Juliette Larthe as a captivating and unique digital art installation to mark the arrival of the equinox through the magic of new floral life. The screen was on site for five days and ran from mid morning until 8pm so that members of the public could enjoy seeing time-lapses that offered extraordinary views into spring through the magic of flowers turning from seedlings to full bloom! 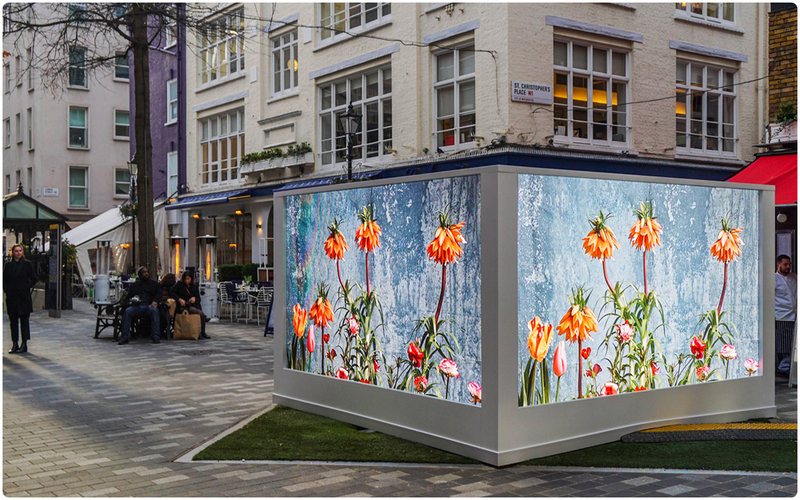 For this outdoor activation, our waterproof and versatile Desay 6.25mm Indoor/Outdoor LED Panels were used to create four 3.2m x 1.8m screens that would be positioned into an outward facing square to enable 360° viewing angles. The four screens were raised up off the floor on Litedeck and were finished with a custom, white, weatherproof cladding. The control system was set up in a nearby building, with the cabling run safely and unobtrusively into the cube. Two Nova MCTRL660 Processors were used to manage the data being fed to the screen with one acting as a fail safe hot back up to the main processor. Content was scaled to the screens using our industry standard Barco ImagePRO II Dual with content sourced and managed using an Apple Mac Mini. A small but powerful PA system was also installed into the exhibition to amplify the film with a poignant soundtrack representing spring time. Four EV Evid 6.2T Loudspeakers were located in the centre of the cube, with a compact Soundcraft EPM 6:2:2 Mixer and amplifier in the control room. The design of the cladding and technical system, project management and health and safety planning was undertaken by Pete McCrea, who managed the onsite installation of the screen and cladding. Installation was undertaken over several hours in the morning, and then removed in two hours after the event. Production AV contracted Congo Blue, who are also part of the SFL Group for the fabrication and installation of the cladding. It was great to see so many people stopping to take photos and appreciating the exquisite range of flowers flourishing into full blooms. 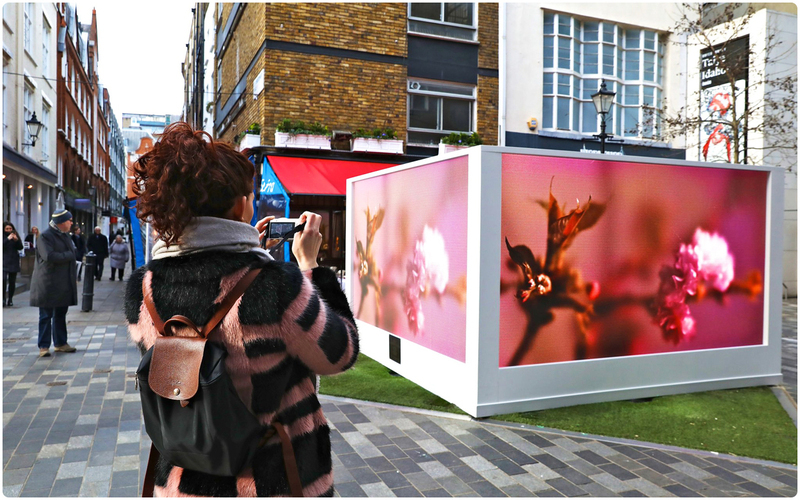 Production AV are always grateful when our services are utilised to display such beautiful artistry and positive messages especially about the arrival of spring! We’d like to thank Four Communications for choosing us as the technical supplier for this exhibition, we have really enjoyed making this project a reality and we look forward to working with you again in the future. Production AV is always on the lookout to support up and coming individuals in the event production industry. So we were excited to be collaborating with the University of South Wales Live Event and Lighting Course, Stage Sound Services, Ashley Raines from Barco and Peter Kirkup from disguise to provide their students with a hands on experience using some of our industry leading video production equipment as well as offer advice and insight into the exciting but enigmatic industry we find ourselves in! Our aim was to provide two workshops for the students to experience and test the capabilities of our equipment. 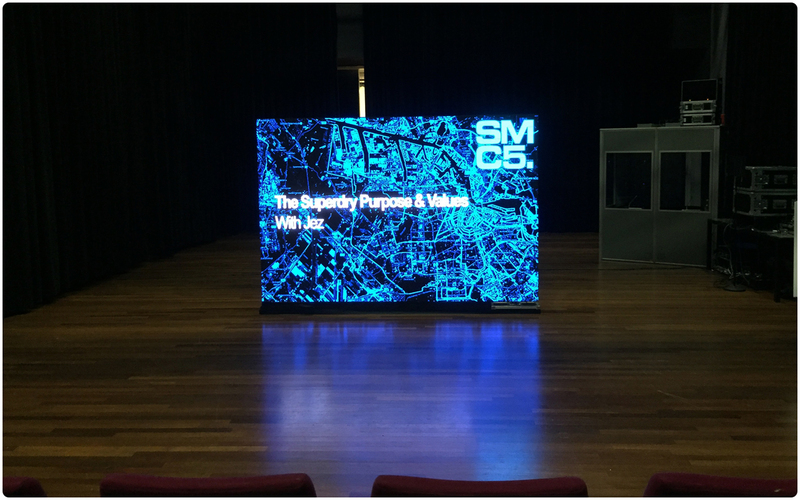 Our first workshop revolved around our DigiLED 3.9mm Indoor LED Screen as well as a Barco UDX-4K32 4K Laser Projector generously provided by Barco. 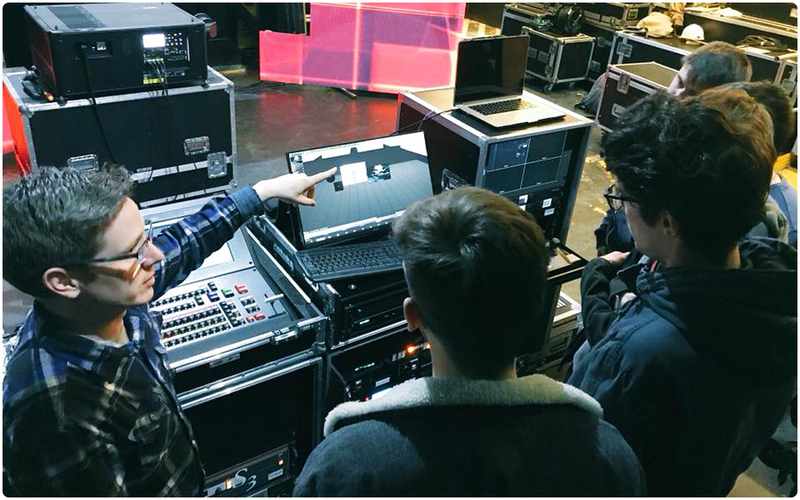 4K video was fed from our disguise 2x4pro Media Server into our Barco S3-4K Screen Management System and Barco EC-50 Event Controller so students could experience how these tools could be used with projection and LED technologies in event production scenarios. Features like PIP’s (Pictures in Pictures), luma keys and widescreen blend capabilities were demonstrated to show how easy it was to create slick and impressive video solutions whilst having the processing power to manage up to twelve different video inputs. Having recently invested in disguise 2x4pro Media Servers, we wanted our second workshop to demonstrate the capabilities of these media servers. 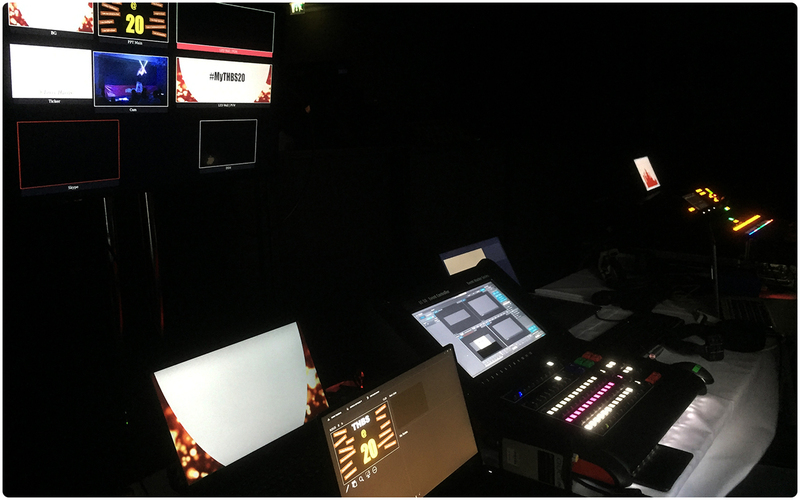 As our 2x4pro’s were driving a large scale project at the Geneva Motor Show Convention, disguise stepped in and provided a GX1 Media Server. 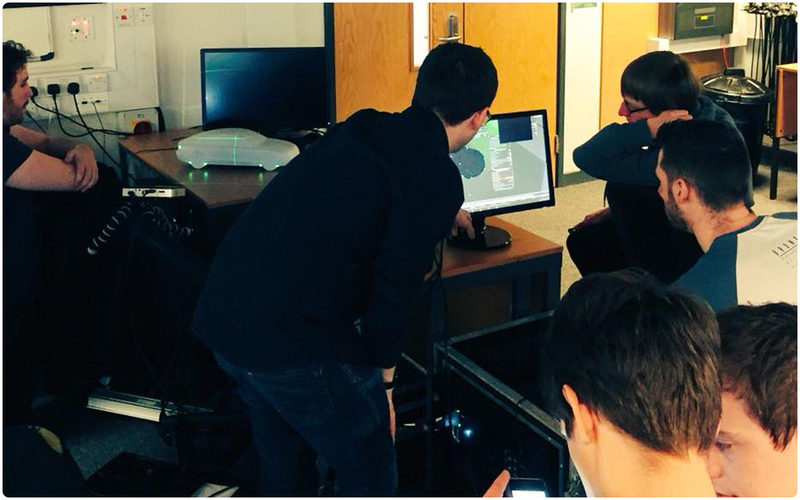 With the assistance of Peter from disguise, four sessions were run throughout the day where students setup a projection mapping solution onto a model car displaying the power and vast creative opportunities that the disguise systems offer. It was a pleasure putting on this demonstration day for USW students and we’d like to thank the University for hosting us as well as Stage Sound Services, Barco and disguise for attending and helping us create this informative and engaging demonstration of our video technologies. We’re looking forward to seeing some of the students out on site in the near future! 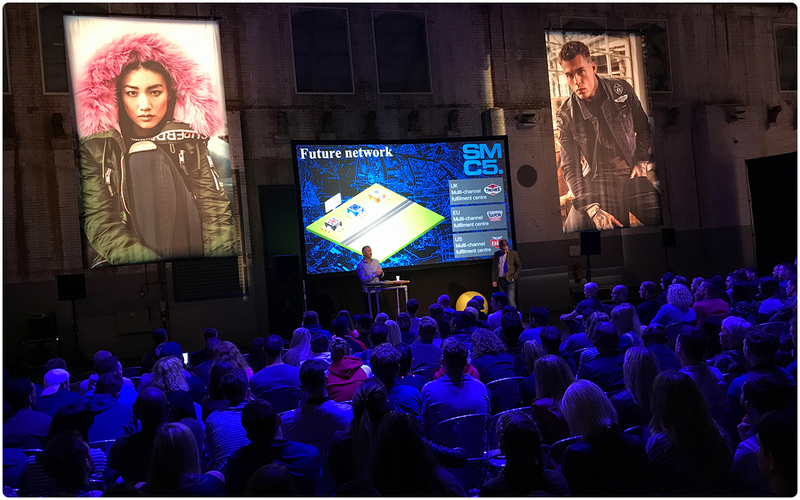 Production AV were pleased to be involved with Superdry’s Store Managers Conference hosted in Amsterdam on behalf of Tarren. We were tasked with providing a full AV solution to the conference space, catwalk and dinner presentation as well as four break out rooms. Our five strong team led by Olie Goulding were onsite providing the coordination and technical knowhow to assist Superdry in maximising the conference and drive home a strong, positive message for 2018. The main conference area provided a space for the Superdry business briefing and a Barco HDX W14 DLP Projector was rested on our projection racking to rear project onto a Stumpfl 16′ x 9′ which allowed the entire audience to fully engage with the presentation through figures and animations. The presentations were loaded onto our PlayBack Pro software and then switched using our Barco PDS-901 9 in 1 Out Seamless Switcher. As this was a complete AV solution, audio was also provided with Sennheiser radio microphones for presenters , l’Acoustic X12 loudspeakers plus l’acoustics SB18 Subs and a Midas M32R Mixing Desk for control. A similar setup was used in the catwalk/dinner presentation space where another Barco HDX W14 DLP Projector projected onto an identical Stumpfl screen. Instead of a PDS, our new Roland V1-HD 4 Input HDMI Vision Mixer capability mixed the show and we were impressed by it’s versatility despite it’s small and simple design. Sixteen D&B T10 loudspeakers were flown in arrays of four supported with D&B B22 subwoofers under the stage. and the show was driven using a Yamaha QL1 Mixer. This delivered superb sound for both the presentations and the catwalk where the the newest range of products were being premiered for their Autumn/Winter Collection. 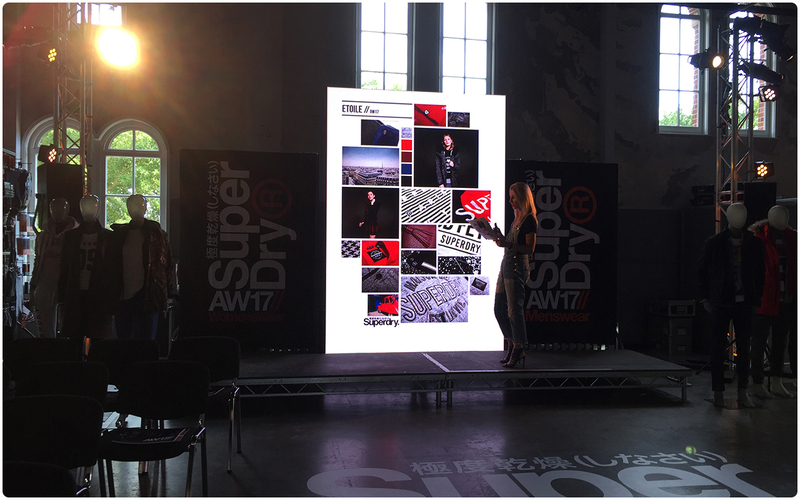 In the breakout rooms we worked with Superdry’s own stock of 3.9mm LED screen modules and created two LED screens. They were being used for more intimate workshops and presentations for 20 – 30 people. Data was scaled using Barco ImagePRO II Dual’s and then fed to the screens using our Nova MCTRL660 Processors. Audio equipment was also provided to these rooms in the form of Sennheiser microphones and loudspeakers. The final area that audio was provided was the mock shops where presenters had Sennheiser radio mics and four D&B M4 loudspeakers were used to relay their voices around the shops. The conference was a massive success with Superdry store managers feeling positive and prepared for the exciting new developments the company has planned for 2018 and beyond. We’d like to thank Tarren and Superdry for their continued support and we look forward to providing the AV solution for the next Superdry briefing.